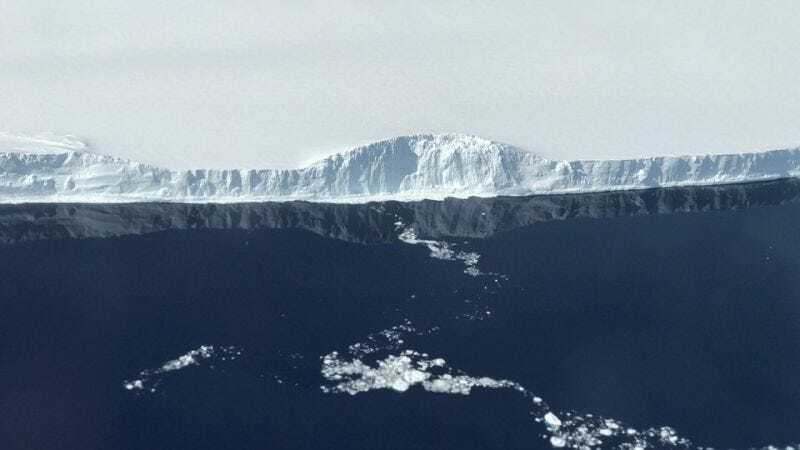 The edge of A-68, the iceberg the calved from the Larsen C ice shelf in July 2017. One of the keys to answering this question lies in the frozen wasteland at the bottom of our planet. Antarctica contains something like 6.5 million cubic miles of ice, which, if melted, could raise global sea level by almost 200 feet! I don’t need to tell you how bad that would be for the 40% of the world’s population that lives within 60 miles of the coast. So, the critical question for many years has been is Antarctica melting? While this might sound easy to answer, it’s proven tricky to predict how ice sheets respond to a warming climate. In fact, for many years the Intergovernmental Panel on Climate Change, which is the leading scientific body investigating climate change, thought that a warming climate would actually mean more ice in the poles. Satellite data has helped correct this narrative in recent years, with most of the scientific community agreeing that Antarctica is in fact losing ice. And now, a new report from the UK Centre for Polar Observation and Modelling provides the first complete mapping of Antarctica’s glacial retreat, showing that warm ocean water circulating beneath glaciers’ floating edge is melting the massive ice sheets. The study, published today in Nature Geoscience, details how over 550 square miles of ice were melted between 2010 and 2016. Map showing rates of grounding line migration and their coincidence with ocean conditions around Antarctica between 2010 and 2016 (seabed temperatures: Locarnini et al., 2013. World Ocean Atlas 2013, Volume 1: Temperature. S. Levitus, Ed., A. Mishonov Technical Ed. ; NOAA Atlas NESDIS 73, 40 pp.). Grounding line locations are from Rignot et al., 2013, Science 341 (6143), pp. 266-270. The ice in Antarctica isn’t melting from the top down, like it is in Greenland, but rather it’s melting from the bottom, where the ice meets the sea. As the temperatures increase in the ocean, warmer water works away at the ice. The problem, explained Shepherd, is that the place where glacial ice meets the sea (called the grounding line) is incredibly hard to reach, being 1-2 kilometres below sea level in a frigid, dark and cold environment. Shepherd and his colleagues were able to track the movement of Antarctica’s grounding line by using European Space Agency’s CryoSat-2 research satellite. By applying an understanding of glacier and sea floor geometry and a bit of math (Archimedes principle of buoyancy) the researchers were able to calculate the retreat in the grounding line across huge swaths of the country. The result is the first ever complete map detailing how the continent’s grounding line is shifting. So, what do these findings mean for sea level rise? While it’s still not totally clear, the fact that Antarctica’s grounding line is retreating is certainly not good news. A study published in the Proceedings of the National Academy of Sciences earlier this year found that accelerated melting in Greenland and Antarctica means that by 2100, the world’s oceans will be at least 60cm (2ft) higher than present. Other computer forecasts suggest that if emissions continue at their current, stupidly-high levels, huge chunks of Antarctica could break up, and lead the oceans to rise six feet or more by the end of this century. This doesn’t have to mean the end of the world. Through proper adaption (seawalls, dams, canals, flood plains and pump systems) and mitigation (curbing emissions ASAP), the worst impacts of sea level rise can be avoided. Of course, the first step needs to be accepting that climate change and sea level rise are problems, and Trump doesn’t seem like the best person to prepare the U.S. for the rising tide.